Ok, so today is my last day in Seoul and without fail, xenophobia raised its head over last time. I am sitting on the bus back to my city and it happened. But first io needed to explain a few things. These ‘Intercity’ buses are awesome. There are only 3 seats to a row. Two on one side, one an another. They are comfy, spacious and not only do the recline, the leg test pops out too! 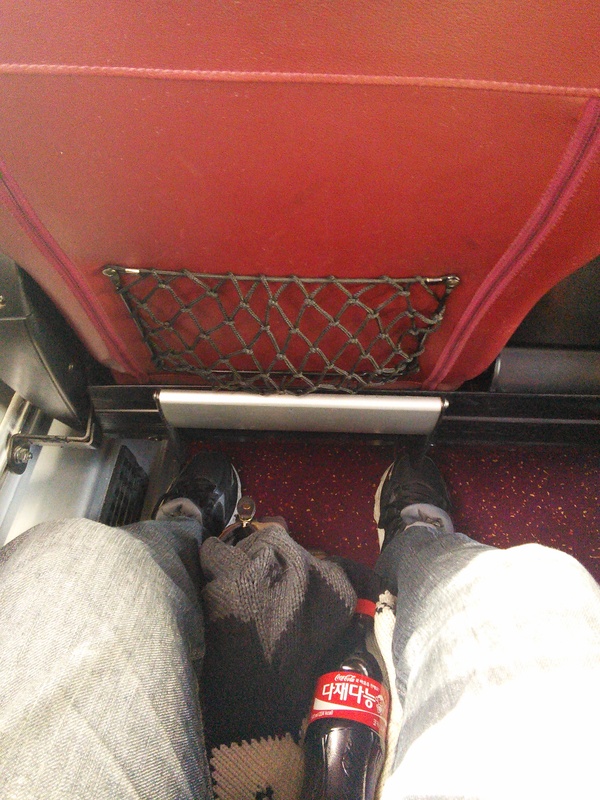 Look at all that knee room! There is a good amount of space between my seat and the seat beside me, and that’s saying something for a guy my size. The Koreans must feel kinda dwarfed by theses seats. That being said, when you but your rocket, you get a seat number. I can’t tell you how many times I’ve seen Koreans NOT sit on their assigned seat only to have the property owner of the seat tell them that it isn’t their seat. So today I see a got her on and by his looks/actions he bypasses his seat beside me and sits further back. 5 mins later he’s kicked out and forced to suit on his designated seat. I still count this as a score as toss bus is usually well populated. So there he did, looking kinda nervous. At least I don’t think he’s going to be one of those people that leans forward and hands onto the seat on front of them for the whole trip. So yeah. Today plus 3 days left! Previous Previous post: My Time in Korea – A Pictoral Walk from Nov 2010 till Feb 2015.